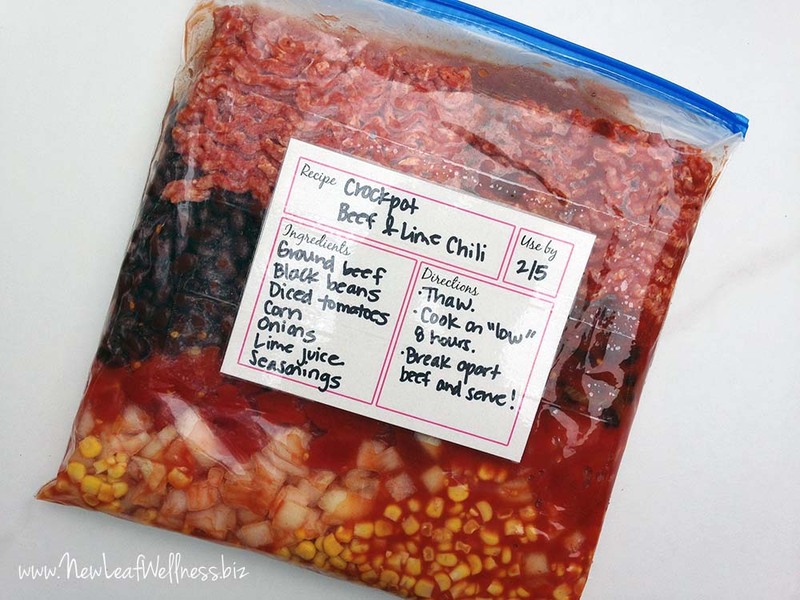 Forget about freezing leftover chili. 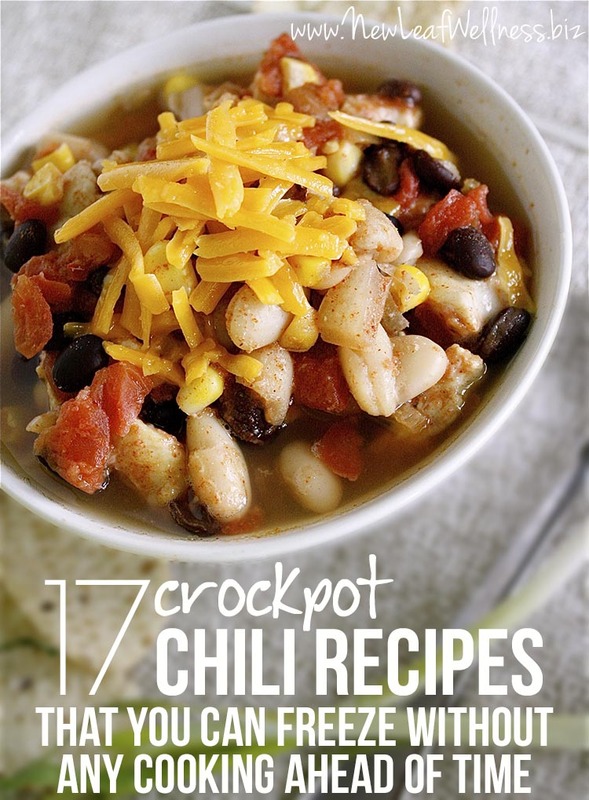 Here are 17 crockpot chili recipes that you can freeze without any cooking ahead of time. Not only are they super easy to make, but they’re absolutely delicious too. Trust me, I even won a chili cook-off competition with recipe #10! If you’re a regular reader then you know I’m obsessed with freezing meals without any cooking ahead of time. 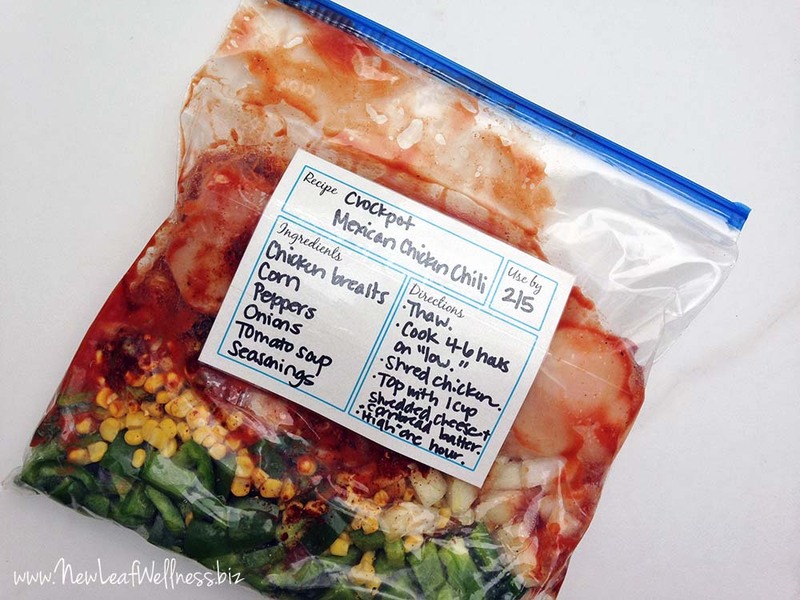 You’ve probably tried this method of freezer cooking yourself and changed your life. If you’re brand-new to New Leaf Wellness, welcome! Since there’s no cooking required ahead of time, the meals are super easy and quick to prep. You can save a lot of money by buying ingredients when they’re on sale and freezing them for later. Now that fall is here I’ll be making tons of soups and chilis. They taste delicious slow cooked in the crockpot all day and make my house smell amazing. I used to brown ground meat before freezing, but I realized it’s completely unnecessary. If you buy at least 85% lean meat, there’s very little fat and the final texture is somewhat “soft” and delicious. It’s totally worth the time saved in the kitchen. Here are 17 crockpot chili recipes that can be frozen without any cooking ahead of time. All you need to do is combine all of the ingredients in a gallon-sized plastic freezer bag and freeze. If you’re not used to combining raw meat with other ingredients, let me assure you that it’s perfectly safe. I did a lot of research when I was writing my No Cook Freezer Meals eCookbook, and the USDA Food Safety and Inspection Service states that freezing to 0°F inactivates microbes present in food (like bacteria, yeasts, and molds). Enjoy! If the recipe doesn’t explain how to freeze and cook later, simply combine the ingredients in a gallon-sized plastic freezer bag and freeze for up to three months. When you’re ready to eat, thaw overnight in your refrigerator or in a large pan of water. In the morning, cook in the crockpot for 6-8 hours depending on the size/strength of your crockpot. Break apart ground meat (if included) or shred chicken (if included). Dig in! 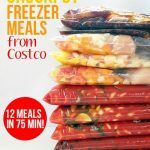 If you’re interested in more easy freezer meals and tips, check out my best-selling freezer meal eCookbooks.